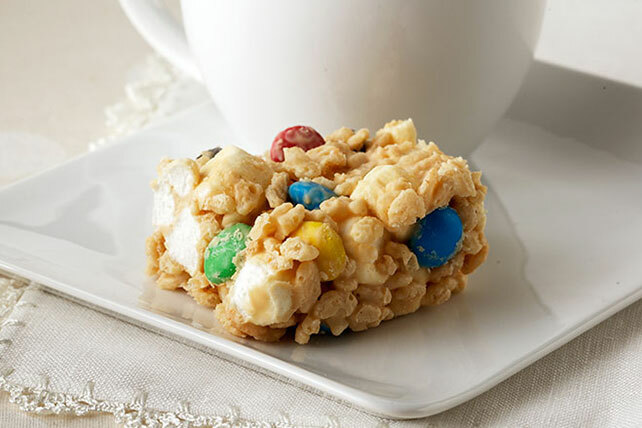 Make our delicious Crispy Avalanche Cereal Bars for everyone to enjoy in just 15 minutes. These white chocolate-peanut butter cereal bars are a fun treat! Microwave chocolate and peanut butter in large microwaveable bowl on HIGH 2 min. or until chocolate is completely melted and mixture is well blended, stirring after each minute. Stir in cereal; cool 5 min. Prepare recipe and cut into bars as directed. Melt 1 pkg. (4 oz.) BAKER'S Semi-Sweet Chocolate as directed on package. Dip corner of each bar in melted chocolate, covering half of the bar. Place on waxed paper-covered baking sheet. Refrigerate until chocolate is firm.